People who love or work with someone with ADD often feel conflicted: they want to help, but they don't want to enable. They value the person's creativity, but they are exhausted. Stephen Arterburn and Timothy Smith address ten myths about ADD, the pros and cons of medication, foods that help to minimize ADD, twelve strengths of people with ADD, new studies on how to calm the mind, showing empathy even when it's hard, and more. This fresh look at ADD-not as a malady but as a unique way of thinking-shows readers that ADD doesn't have to ruin their relationships. In fact, it can make them stronger. 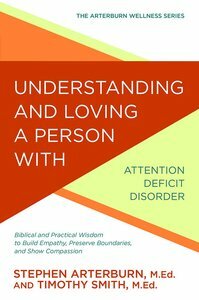 About "Understanding and Loving a Person With Attention Deficit Disorder"
Stephen Arterburn is the founder and chairman of New Life Ministries, America's largest faith-based broadcast, counselling, and treatment ministry, and is the host of New Life Live!- a daily radio program heard on more than 180 radio stations nationwide. He has been featured in publications such as The New York Times, USA Today, and TIME magazine. Arterburn is also the founder of the 'Women of Faith' conferences and has written over 60 books, including the best-selling Every Man's series. He has been nominated for writing awards and has won three Gold Medallion awards. Arterburn is a well-known public speaker and in August 2000 was inducted into the National Speakers Association's Hall of Fame. He lives with his family in Laguna Beach, California. Some of his published works include Transformation, Finding Mr Right, Control what is controlling you, Boiling Point and NLT Every Man's Bible. Timothy Smith is a family coach, conference speaker, president of Life Skills for American Families, and the author of several books including Letters to Nicole, Family Traditions, and The Seven Cries of Todaybs Teens. He is a research fellow with the George H. Gallup International Institute and a radio commentator. He and his wife have two young-adult daughters and live in Southern California.